Our 2-bedroom apartments comfortably sleep 4 people in the bedrooms, with the added flexibility of a double sofabed that provides for 2 extra occupants. The bedroom is en-suite with L'Occitane toiletries. The fully-equipped kitchen makes self-catering a reality, although there are plenty of restaurants within easy walking distance. And our daily patisserie delivery service gives you the option of having lovely fresh-baked croissants, bread and other pastries delivered each morning. A great start to any day! A comfortable and spacious living area with flat-screen TV, DVD and CD player keeps everyone entertained when you're not out enjoying the fabulous mountains all around Morzine. Our 2-bedroom apartments comfortably sleep 4 people in the 2 bedrooms, with the added flexibility of a double sofabed that provides for 2 extra occupants. All bedrooms have en-suite facilities with L'Occitane toiletries. Fully-equipped kitchens make self-catering a reality, although there are plenty of restaurants within easy walking distance. And our daily patisserie delivery service gives you the option of having lovely fresh-baked croissants, bread and other pastries delivered each morning. A great start to any day! 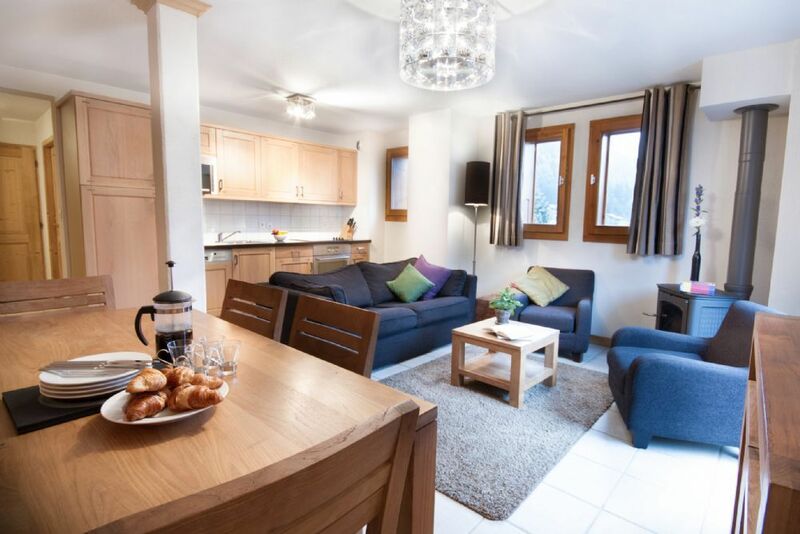 A comfortable and spacious living area with flat-screen TV, DVD and CD player keeps everyone entertained when you're not out enjoying the fabulous mountains all around Morzine. Very nice staff, well equipped apartment! Situated close to Skilift and supermarket. I will for certain book the apartment again. Great location and very comfortable apartment we had this year looking a bit tired needs some attention but overall a good place to stay. So happy you had another great stay with us - hope to see you back again! close to town means you hear the drunks at night. Communication prior to stay sometimes good sometimes less so. Still awaiting reply on a couple of queries about best ski school! Pastries to door... not exactly accurate as we collected from the reception every morning. Aiglon very quick to take money in advance - which was slightly annoying. Not L'occitaine products as advertised. Would we stay again, possibly but will review all options Again. Thanks for taking the time to leave a review. We've checked back with our onsite manager on your specific points. Noise - we're centrally located (as advertised) but not in the main bar area. However, we do occasionally get people passing by who are still "enjoying" their night out on their way back to, no doubt, an apartment a long way out of town. On this occasion, there was a large event happening in town, and this most likely was the cause. It's not a regular occurrence by any means. Communication - we're investigating how your ski lesson question was missed, although there was a lot of correspondence around your ski passes and other elements which were taken care of promptly. Please accept our apologies that we missed a point here. Pastries to door - these are delivered "before 9am" as advertised. However, we understand you had early ski lessons and therefore you had left prior to our delivery to the door. The pastries were in reception as you noted. Quick to take money - we're a little confused by this. Our policy (again, as per booking terms) is balance to be paid 8 weeks prior to arrival. Any extras (in your case, a lot of lift passes) are sent as a confirmation by email, and are paid for on order. We waited a couple of days after your requests before taking payment. We'd love to know what your expectation was here, so we can see how we could improve. L'Occitaine - this was a very unfortunate situation which affected any property using L'Occitaine in France. The French distributor ceased trading and we had to replace their products with another of equal quality. We've now taken the opportunity to source an even better replacement which we'll be providing for next winter. Given the above, we hope to see you again next season. 1 Bedroom with 2 single beds. 1 Double sofabed. Towels and linen provided. End of stay cleaning included (except kitchen area). Price excludes Taxe de Sejour (Tourist Tax), which is &euro;1.80 per adult per night. This will be added to your guest bill to be settled during your stay.